This painting was discovered by Carl von Lorck in 1941 in the palace of Basedow in Mecklenburg along with other paintings by Friedrich. Two years after publishing the news of his discovery, Von Lorck discovered two more works by Friedrich in the same building. He deduced that they had been acquired directly from the artist by the owner of the palace at the time, Count Friedrich von Hahn (1804-1859). Also in the same collection were works by other Romantic painters such as Koch, Catel, Dahl and Blechen. Von Lorck's dating of not later than 1830 has not been disputed. After comparing it with other works of this period Börsch-Supan acknowledged that it belonged to the last years of Friedrich's career, and in 1976 he suggested that it was completed around 1832. 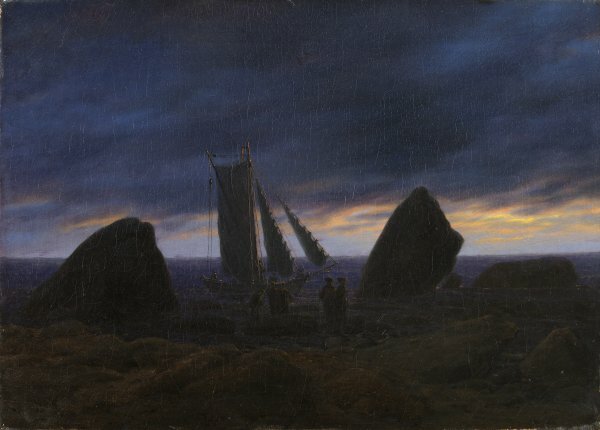 Other works of similar dimensions from this period reveal notable similarities, among them Seascape with the Setting Moon (Leipzig, Museum der bildende Kunst), Marshy Beach (Hamburg, Kunsthalle), and The Nets (St. Petersburg, Hermitage), as well as other works completed just before this, for example, Sunset on the Baltic Sea dated 1827 (Schweinfurt, Dr. Georg Schäfer Collection), and also which reveals similar features. The possibility that the painting belongs to a cycle or series of seascapes or views with a common theme has not been considered. However, this would not be at all exceptional, since many of Friedrich's works have a corresponding pendant or form an element within cycles representing the hours of the day or the actions of nature. Indeed, the fact that this painting was found alongside six others raises the possibility of a deliberate harmony of subject matter, to which the artist may have contributed to an extent that we cannot know. Of that group of paintings, two in particular share dimensions and themes with Fishing Boat by the Baltic Sea. These are Boat on the Elbe in the Morning Fog (Cologne, Wallraf-Richartz Museum) and Reefs by the Shore (Karlsruhe, Staatliche Kunsthalle), although both were executed in the previous decade. Whatever the case, one cannot rule out the possibility that the group of views acquired for Basedow was intended to have a poetic coherence. The painting shows a sailing boat heading away from the Baltic shore with several fishermen aboard. The unidentified location is probably Pomerania, near Rügen, since this was used in so many of Friedrich's views, even though it does not correspond to any of the painter's sketches from nature. The scene, set at twilight, shows a group of men with their backs turned to the viewer, observing the departing craft, although apparently without making eye-contact with the sailors. The presence of these men, dressed in traditional German costume, is not easy to account for, and contributes to the enigmatic nature of the seascape. Their attitude and proximity to the boat suggest that they may have lent some aid to the fisherman, perhaps helping them free their boat after it had run aground on the rocky shore. It is only when we compare the composition to a drawing made by the young Friedrich in Berlin in 1799, entitled Farewell at the Shore (Mannheim, Kunsthalle), and depicting an identical boat and similar figures, that we realise that this is indeed a farewell scene. Friedrich's central motif is thus the separation of the two groups of men, those who have embarked and those remaining on shore, and the positions of each in nature. The allegorical reading of this seascape lies in the contrast between the two groups in a situation involving leave-taking. The composition has an orthogonal distribution, marked by the dividing line of the prow, the triangles framing the objects represented, the longitudinal axis and the lines of the shore and horizon, which sharply divide the spaces. The focal point of the scene is stressed by the effect of the concentration of lights in this area. The strip of light on the horizon and the surface of the sea occupy a quarter of the picture surface beneath the curtain of clouds that invade the upper half of the scene and the back-lit volumes that fill the foreground. The strong contrast of light between the foreground and background seems intended to thwart the viewer's grasp of the distances involved, but this difficulty is offset by the orderly and measured distribution of the different volumes and figures.